Not only is water for the environment helping to bring about the return of rare and threatened species in Gunbower Forest, it is also being delivered efficiently through reuse. The internationally recognised Gunbower Forest is showing positive signs of recovery, bolstered by 2018 environmental watering. Efficient water use has meant that 78 percent of the flows delivered to Gunbower Forest were actually 'return flows' that had been delivered upstream in the Campaspe and Goulburn Rivers for environmental purposes, then reused in Gunbower Forest - providing benefits not only to those rivers but also to the Forest and River Murray as well. 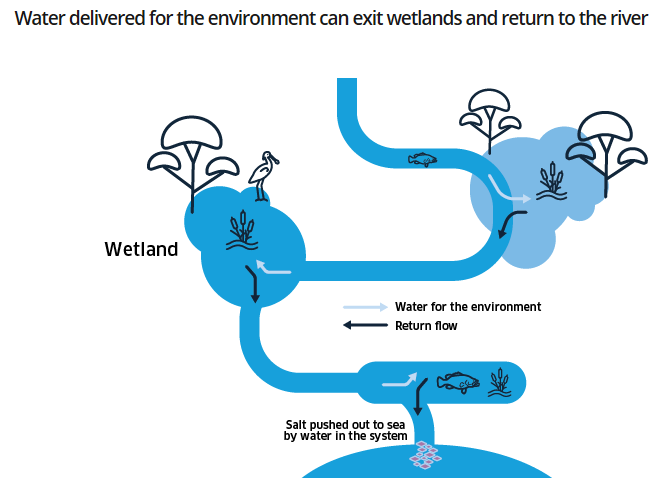 Return flows are the component of water that is delivered to a river or wetland for environmental purposes that either flows back into a river channel or out the end of a river system and can be used for other environmental purposes further downstream. 18,902 ML (36 percent) of the flows that entered the Forest flowed back to the River Murray and will now benefit downstream floodplains and environmental sites, such as the Lower Lakes, Coorong and Murray Mouth in South Australia. North Central CMA Project Delivery Executive Manager Tim Shanahan explained the return flows to Gunbower Forest: "From the rivers upstream, the water then passes through Gunbower Forest filling up its wetlands, and some of the water continues on its journey, exiting the forest and ending up back in the Murray River. It may even be used again multiple times by the environment as it travels downstream, in the river channel itself and at other floodplain sites." "That is an amazingly efficient use of water in anyone's language. And it is also great for our native fish, who will thrive on the food that comes off the floodplain and back into the creeks and river." From its first drink of water for the environment in 2014, Gunbower Forest has been making a slow but steady recovery from the negative impacts of the Millennium Drought and more than a century of regulation of the River Murray, such as through the construction of the Hume Dam and other structures to regulate river flows for water supplies and irrigation. River regulation has meant that fewer floods occur and often for a shorter duration, meaning that less water reaches the forest and its plants and animals. Prior to this regulation, Gunbower Forest was naturally flooded around seven out of every 10 years. However, the lack of flooding over the past couple of decades has put a huge strain on wetland and floodplain plants that provide such critical habitat for water-dependent animals. The forest and its many wetlands rely nearly solely on the regular delivery of water for the environment to mimic natural flooding, which would have occurred prior to river regulation upstream and on Gunbower Creek itself. The forest understorey in areas that have had successive watering looks healthy, with threatened species like the wavy marshwort and culturally important plants starting to flourish. Thousands of waterbirds have been noted recently foraging and roosting in the forest wetlands. There have been some with breeding plumage, though no nests just yet – but watch this space! There has been good growth of 'old man weed', which is a cultural medicinal plant Traditional Owners have been collecting. Lots of campers out in the forest and anglers, especially for the inaugural Cohuna Fishing Classic. The health of plants within the understorey of river red gum and black box woodlands has increased, including 13 rare and threatened plant species. Understorey vegetation in river red gum forests and Box woodlands is in the healthiest condition since monitoring began in 2005! They provide shelter, feeding and nesting habitat for animals. In response to inundation over many years, the health of wetland plants has increased. In 2016-17, the diversity of wetland plants was 30 percent higher than 2012. Three threatened plant species were recorded in the wetlands in autumn 2017. Eight species of waterbirds were recorded in 2016-17 including waterfowl, colonial waterbirds and other wetland-dependent birds. Progress has been made in the recovery of threatened native fish species. Five out of nine threatened species were recorded in Gunbower Creek in 2016-17. Widespread natural flooding, combined with delivery of water for the environment, resulted in the movement of native fish between the River Murray and Gunbower Forest. The current environmental watering program is reinstating a more natural flooding regime as part of a long-term strategy to restore the forest's health, protect its ecosystem and build its resilience, should there be future dry conditions. Flood-dependent understorey, which is diverse and unique to Australian ecosystems in the Murray-Darling Basin, has come back underneath the river red gum trees where there was previously bare ground during the Millennium Drought. There have been encouraging improvements in native fish populations, particularly small-bodied species (such as carp gudgeon and Australian smelt) that are able to enter and use the wetlands to spawn and as a nursery ground until they are old enough to go back into the system, where they become part of the greater food-web for large-bodied fish like golden perch and Murray cod. The whole community benefits from water for the environment – it's not just for the forest and its plants and animals. Keeping the assets of the forest in good health is important for local tourism and the region's businesses. The forest provides economic values through timber production, apiculture (bee keeping), education, recreation and tourism. More than 95 percent of locals in the region surveyed by North Central CMA said that they value Gunbower Forest for its recreational opportunities and as an attractive place to visit. 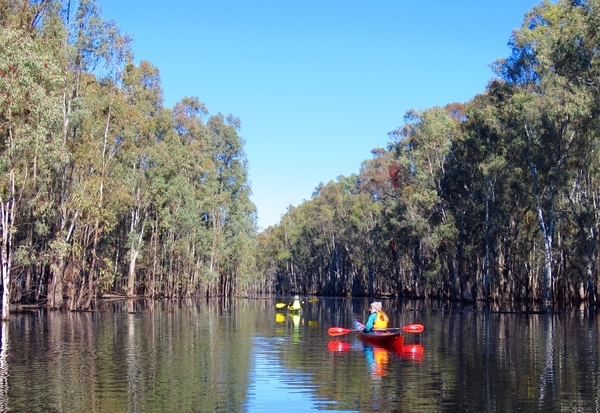 Kayaking and canoeing tours are popular in Gunbower and this year paddlers took advantage of the environmental watering, admiring the beauty of the forest and contributing to the tourism economy. Shannon O'Brien of Murray River Adventures, which runs eco tours throughout the entire Gunbower system, said, "During my four months of kayaking into the flooded forest, I was able to guide my children, quite a few locals and many out of town visitors into areas that they wouldn't have dreamt of accessing by themselves. "We came across a wide variety of native animals and what seemed like a million birds. There is no other place like this in Australia that has relatively simple access into such a wonderful ecosystem, and the opportunities for eco-tourism will be a strong economic boost to this region."